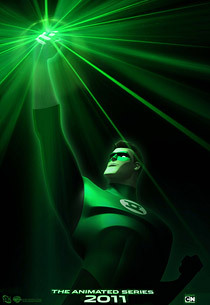 Here's your first look at Green Lantern: The Animated Series, coming to Cartoon Network in 2011. Warner Bros. Animation, which is producing the show, will preview the upcoming DC Comics adaptation for fans at this weekend's New York Comic Con at the Jacob K. Javits Center on Manhattan's West Side. Executive producer Bruce Timm — whose infinite credits include the beloved animated series starring Batman, Superman and the Justice League — will headline the panel on Saturday at 2:30pm, alongside producer Giancarlo Volpe (Star Wars: The Clone Wars) and producer/story editor Jim Krieg (Ben 10: Alien Swarm). Following the panel, from 4:00 to 5:00pm, the team will be signing posters (with this image) at the DC Comics booth. Green Lantern, one of DC's most popular superheroes, is a member of an intergalactic police force dedicated to protecting the universe. He wields a power ring that can create hard-light constructs of any object he imagines. It will be a big year for the character, who also headlines a feature film, opening June 17, 2011 with Ryan Reynolds in the title role. For more information about New York Comic Con, click here. The older version of Superfriends looked better. Thats what he was in.